Gamma Girl slots - Is this superhero the one for you? Girl power! This superhero-themed slot game is exhilarating! Go on a super fun adventure with Gamma Girl herself to win FREE spins and multiplied wins. PLUS, there's a fab jackpot prize! 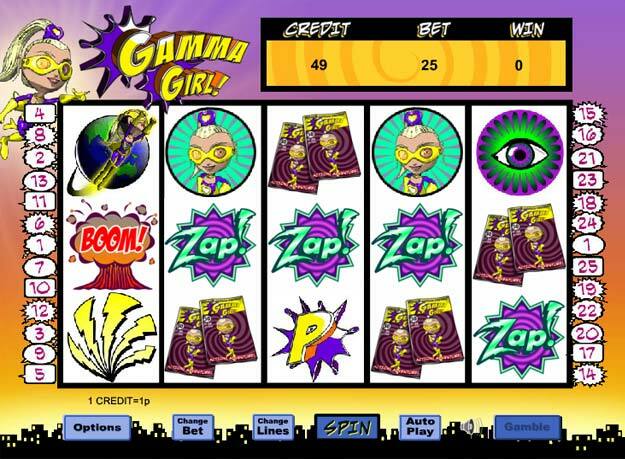 Have some superhero fun with Gamma Girl slots. She's cool, cute and tons of fun and playing this slot game will give you the chance to get to know her a little bit better. With its fun superhero theme, 25 pay lines and an exciting three bonus rounds to look out for there are tons of top features to keep your eye on. There are plenty of scatters, wilds and other special symbols to look for and as you keep playing you should see the chance to pick up some fabulous jackpot prizes.